Open & read corrupt and healthy multiple EMLX files. You can open any EMLX file with Kernel Free EMLX viewer, whether it’s corrupt/damaged or healthy. With the “Recurse subfolder” feature already enabled in the software, it automatically searches and scans for EMLX files in your system. 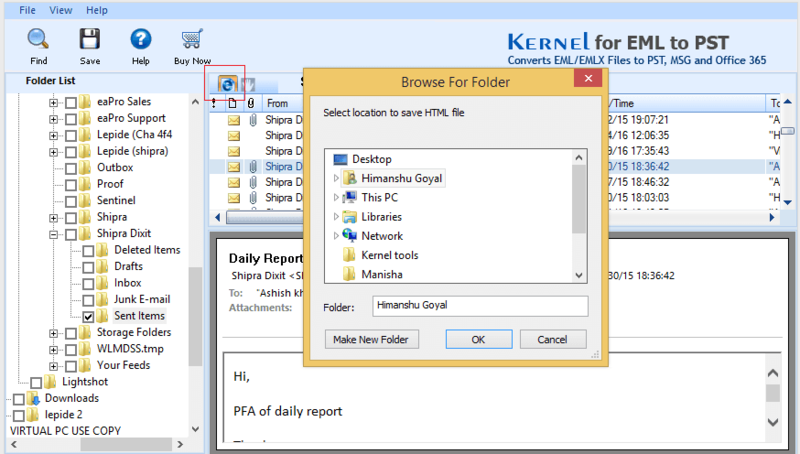 Kernel Free EMLX Viewer is independent of its email clients, which means you can open and read its data without installing its native program on the system. With this tool, you can open multiple EMLX files in one cycle and access their data. The user-interface of Kernel free EMLX is one of the extensive features of the tool. You do not need to have any technical knowledge to view EMLX file data. This tool allows you to save the recovered EMLX file in HTML format after viewing its data. Kernel EMLX Viewer is compatible with all Windows operating systems including Windows 10, 8.1, 8, 7, Vista, XP, 2000, 98, NT, and 95. Kernel EMLX Viewer is available free of cost to download for every user. You’ll not have to provide any credit card information to use it. 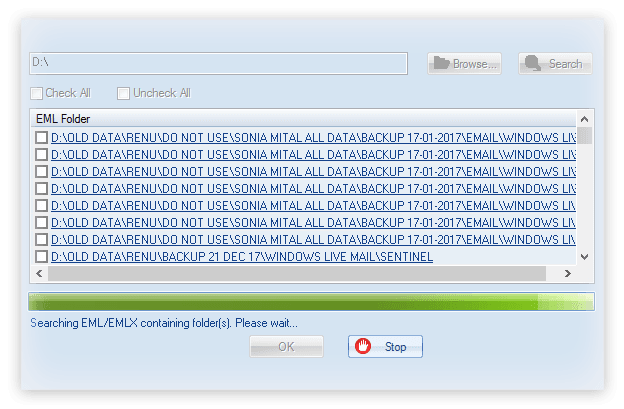 What is an EMLX File? 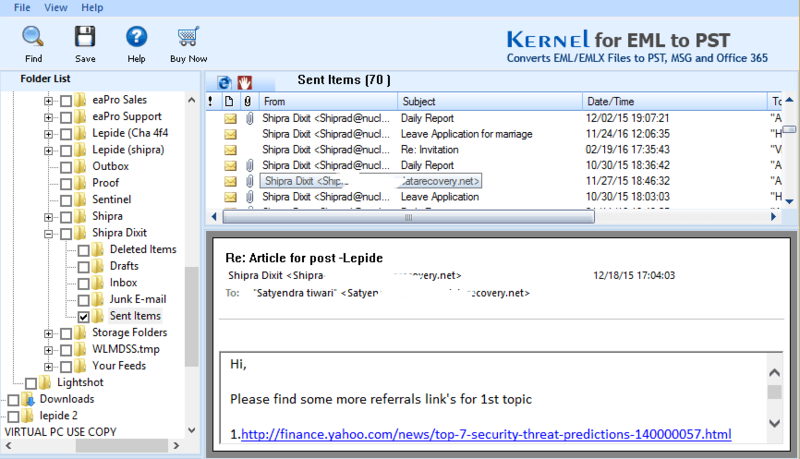 Files with .emlx extension are mail message files used to store an email message. EMLX files were implemented and developed by Apple for Macintosh operating system. EMLX files are plain text files and stores only a single email message. EMLX files can also be opened with a normal text editor and Apple Mail. What Need Does EMLX Viewer Tool Fulfill? Opening multiple EMLX files at once. 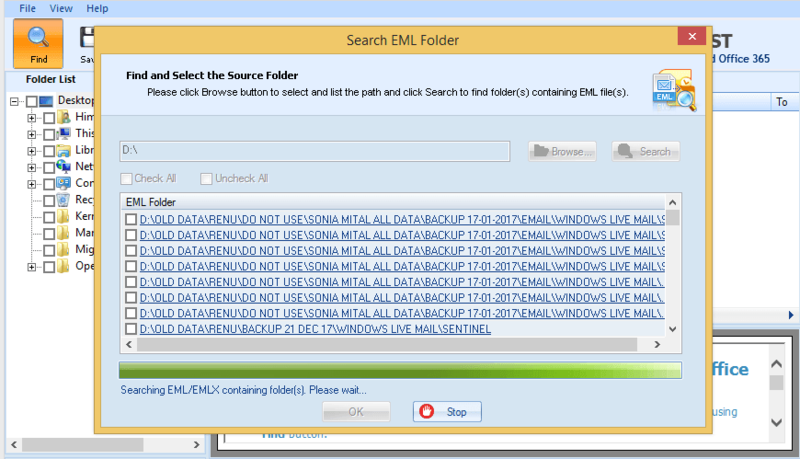 Select Selecting a file in EMLX Viewer with search feature. Open Previewing the data of EMLX file. 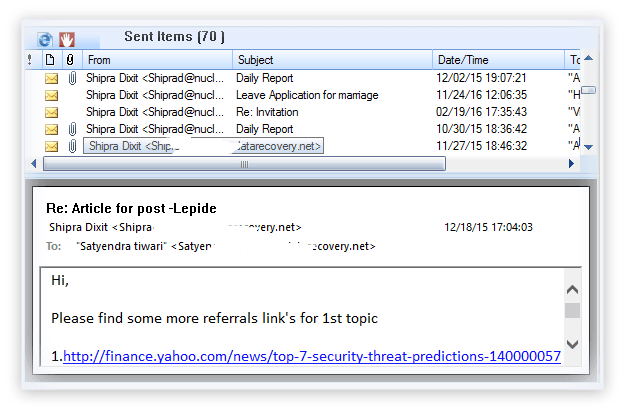 View Saving EMLX email list in the HTML format. How do I search for EMLX file using Kernel EMLX Viewer? Launch the software. Go to file and click on Find or press Ctrl+F. Search EML Folder comes up. Click Browse. Select EMLX folder Path. Click Ok.
Click Search on the dialogue box. To View the files, click on the files on the list below the browse a Search buttons. 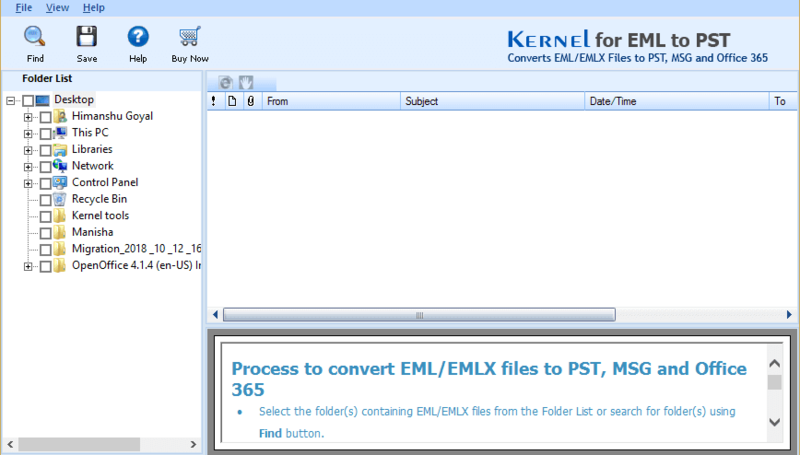 How can I convert EMLX Files to PST or MSG formats using Kernel EMLX Viewer? Launch the app. Select the EMLX folders in the Folders’ list. Go to File to click Save or press the Save button. Select ‘Convert all items’. And press Next. click on the button Where, select a criterion (From, To, Subject and Date) from the dropdown menu. Click Add. Click Next. The process of conversion begins. Do I have to pay any thing to download the Software? The Software is free to download. The download requires some very simple steps and the link is there on our website. What makes Kernel EMLX Viewer better than other EMLX tools? Kernel EMLX Viewer is absolutely free to download; you don’t have to pay anything to use this tool. Also, it allows you to save recovered EMLX file to HTML format. What is the maximum file size that this tool support? You can open an EMLX file of any size. There is no file size limitation with Kernel EMLX Viewer. Can I save recovered EMLX file on my system with this tool? You can save the repaired EMLX file in HTML format. Is this tool capable of converting EMLX to PST? No, this tool only allows you to view EMLX file data. If you want to convert EMLX file to PST, then purchase the personal license for this tool. What is the compatibility status of the Kernel EMLX Viewer? Kernel EMLX Reader is highly compatible with all Windows operating system, including Windows 10/8.1/8. Welcome screen of Kernel Free EMLX Viewer. Selecting a file in the EMLX Viewer with search option. 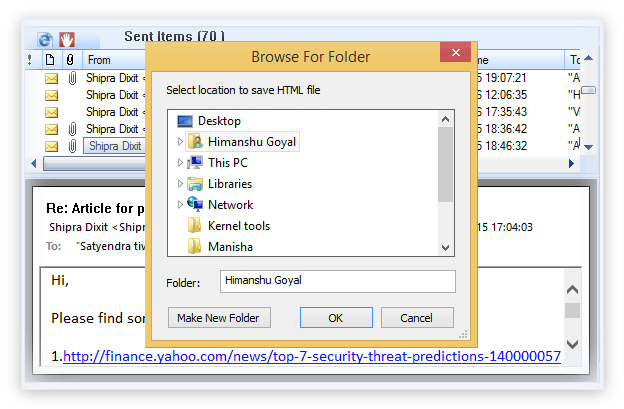 Tool displaying the content of selected EMLX file. Saving the email list of EMLX file in HTML format. The software works fine even on my Pentium powered machine. 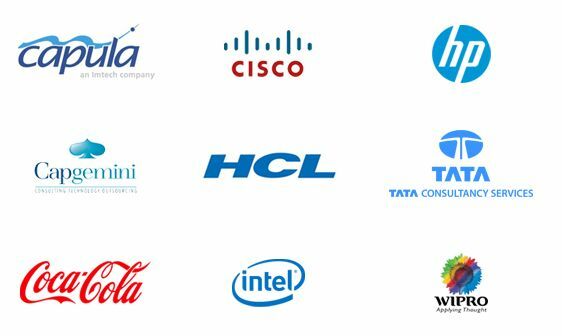 They are the epitome of advanced products and amazing service. Finally found a reliable software at affordable price. No 2 ways to not select this tool.